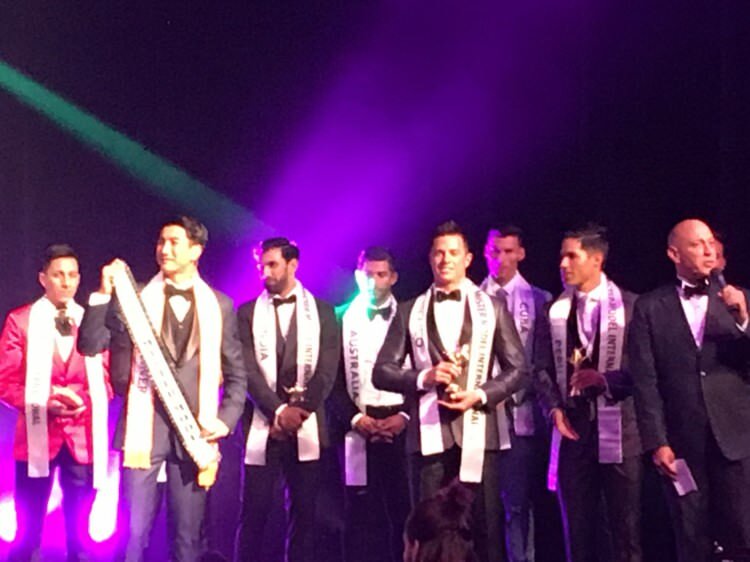 So I attended MISTER MODEL INTERNATIONAL 2018 on March 10th. 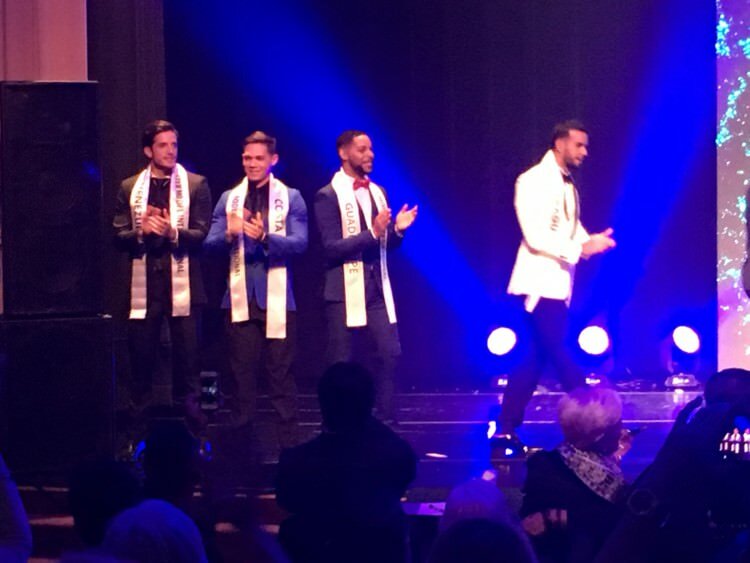 I’ve never been to a live pageant of any kind before, and since I live less than three hours from Miami (and male pageants are my favorite), I decided to take the weekend and attend this one. Here’s what I saw. The venue was very small, like a high school auditorium, with a small stage. In fact, each seat had a fold-out desk for taking notes as in a lecture hall. The event was advertised as starting at 8PM, but didn’t start until 9:40PM. People kept trickling in until the hall was about half full, meaning there were probably 200 people there at its fullest. 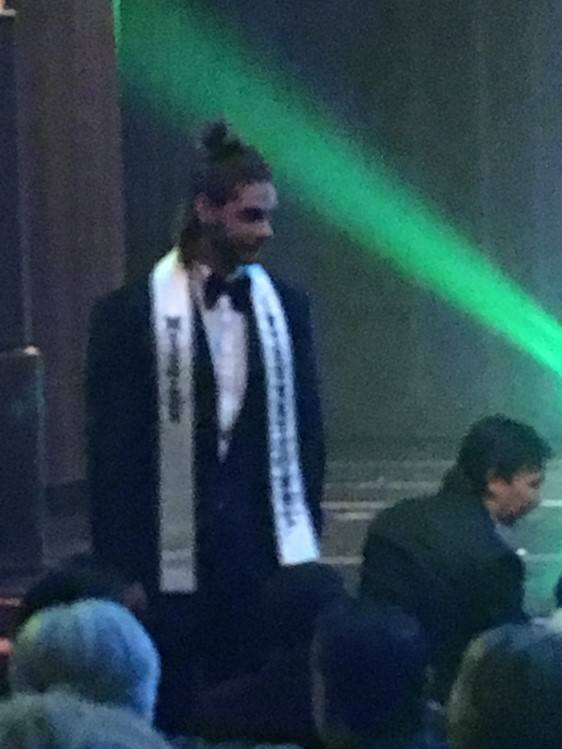 While waiting, about an hour before the pageant started, I saw a shirtless Bolivia peek out from the side stage and wave to someone in the front row. 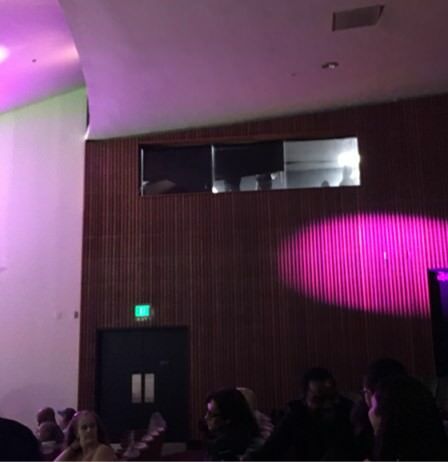 I also noticed a window overlooking the audience where I could see the contestants. This is where they would congregate and change, but blinds and distance prevented me from seeing too clearly. I could tell they were contestants by the t-shirts they wore. One of them was texting with some young women sitting a row in front of me. They looked up to the window and waved to him. In the lobby by the auditorium entrance were tables set up for the silent auction of the gifts the contestants brought from their home countries. Australia, for example, brought a boomerang. Chile brought a bottle of Chilean wine, Lebanon brought a cedar plaque, and Indonesia brought a batik map of Indonesia with the different provinces/regions represented by different batik patterns. A few contestants did not have gifts in the auction. 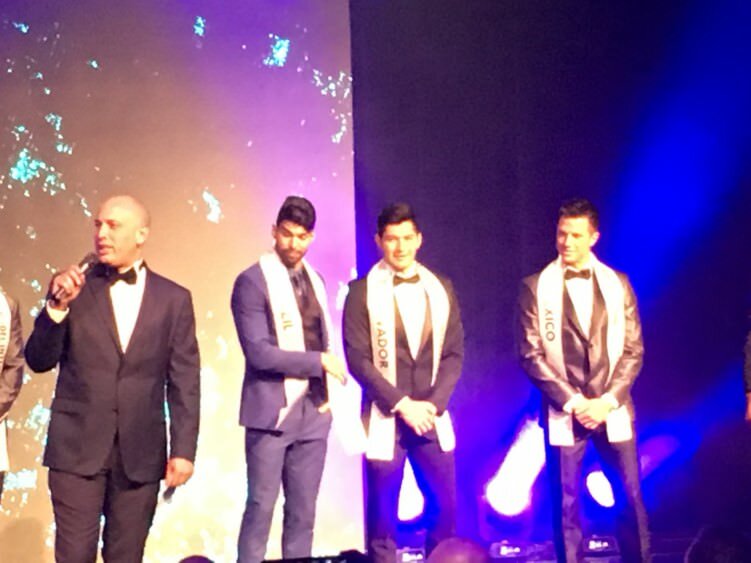 One of the people listed on the website as a host, Francisco Escobar (Mister World 2012/2013), was not a host, but he was there. I actually didn’t recognize him the first several times I saw him, but when he settled in the row behind me and I finally saw his face clearly, I realized it was him. He’s got a very short (I think unflattering) haircut and is very lanky. He was wearing a simple black suit with a white linen shirt, a skinny black tie and white tennis shoes. 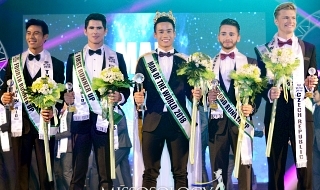 Personally, I think most of the contestants in the pageant are better looking than him, but Mister World is clearly a much different pageant (and he won six years ago). I just know that I wouldn’t notice him if I passed him on the street. He knew many of the people organizing/running the show since he interacted with them quite often during the evening, but I don’t know why he was not hosting as listed. He seemed to enjoy the presence of the bar, taking the opportunity to get a drink almost every time there was an interval in the pageant (not that I’m judging. I’ve been known to enjoy a cocktail or six). They certainly seemed to loosen him up since his clothes became increasingly disheveled by the end. About ten minutes before the pageant started, they announced, in English and Spanish, that the pageant would start soon and then thanked all the sponsors. Almost everyone in the audience spoke Spanish. In fact, I haven’t had so many people address me in Spanish (thinking I spoke it) since I was in Chile over 15 years ago. The audience largely consisted of people who knew the contestants or were student designers (and their friends) at Miami International University of Art and Design, one of the sponsors. Thursday and Friday before the pageant, the contestants had modeled creations by these student designers, one of whom would receive an award for best student designer during the pageant. Finally the pageant started. 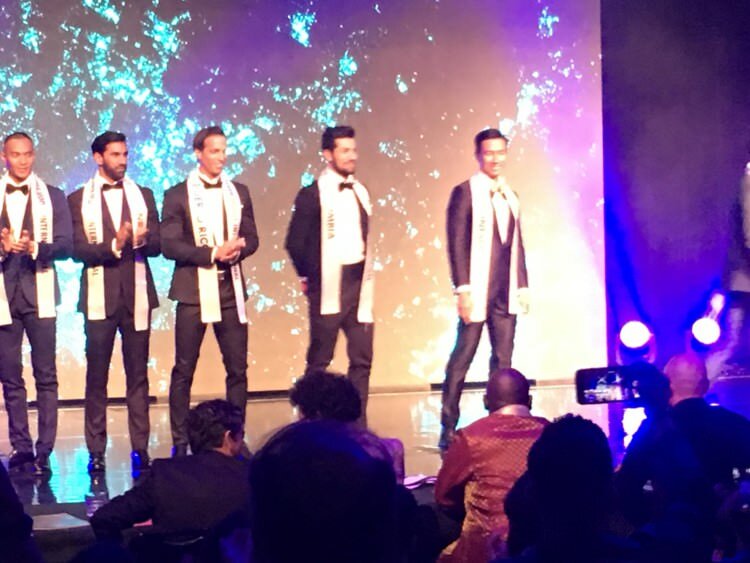 A quick montage video of photos of contestants in their swimwear (the ones on the website) was shown and then the contestants came out on stage wearing jeans, white t-shirts that said “Mister Model International 2018”, and no shoes. They did a simple dance that involved a lot of swaying, arm swings and crossing the stage in opposite directions, moving from back to front so the same contestants weren’t always in front. 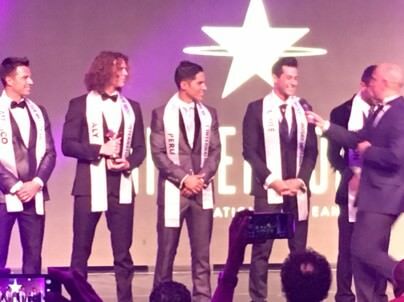 They were not wearing their sashes so you didn’t know who each was. Lebanon, unfortunately, was “dance-challenged” as we would say in theatre in high school. All the contestants would sway in one direction and he would move in the other. In fact, the host, Luis, even called him out for having trouble dancing. But Lebanon took it with good humor and a big smile on his face. He even came forward and took a quick bow to acknowledge that he’s a bad dancer! 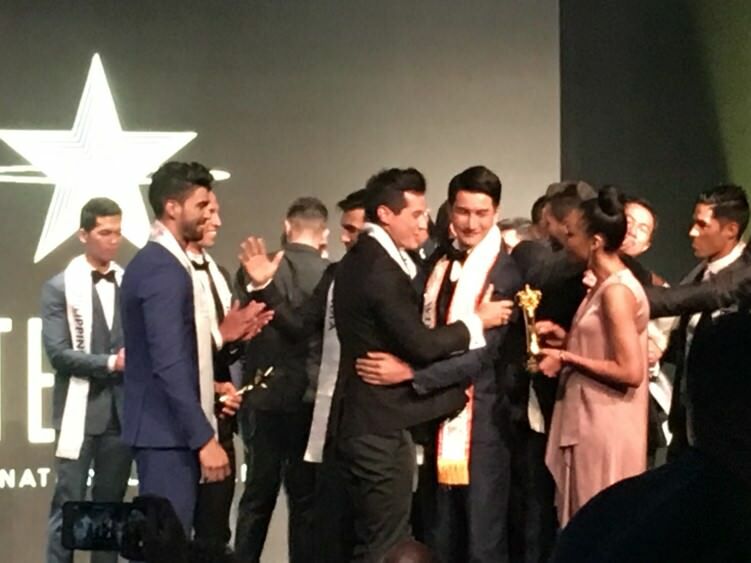 Luis, who is also in charge of Mister Model International, hosted in English and Spanish (mostly English) while a woman whose name I missed, but strongly resembled Lu Sierra (but was not Lu Sierra), co-hosted in Spanish. They bantered a little, with Luis announcing that there were 28 contestants, 26 of whom had never been to Miami (my guess would be two of the three of USA, Cuba and Bahamas). Or rather he said there were 28 countries competing, though technically there are only 26, with two contestants from Brazil and two from either the Philippines or Italy depending on how you classify the Philippine Community in Europe contestant. Then they left and announced the Parade of Nations, starting with Indonesia. The contestants each came forward and announced their names, ages, and the country they represent, seemingly in a random order. It was very fast. The biggest applause from the audience was for the contestants from Mexico, Venezuela, USA, Chile, Dominican Republic and Cuba. Especially Cuba. It was time to announce the winners of the special awards. 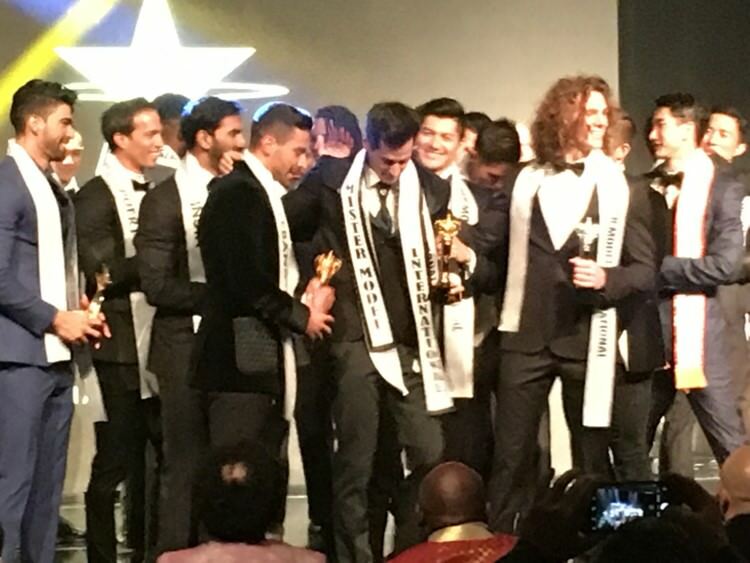 Each winner would come forward and receive a tacky looking trophy of stars from someone who looked like Daniel Alfaro Barrantes, who represented Costa Rica in Mister World 2016. Then the winner would move to the side but stay in the front. Mr. Fitness – Luis said that during the 11 days the contestants were in Miami, a constant refrain was “I’m hungry, I’m hungry, I’m hungry”. Then he made a joke about Mister Hungary (a country not competing). Luis said that one contestant, however, was obsessed with his physique rather than food. The female co-host then announced Costa Rica as the winner of the Mr. Fitness award. 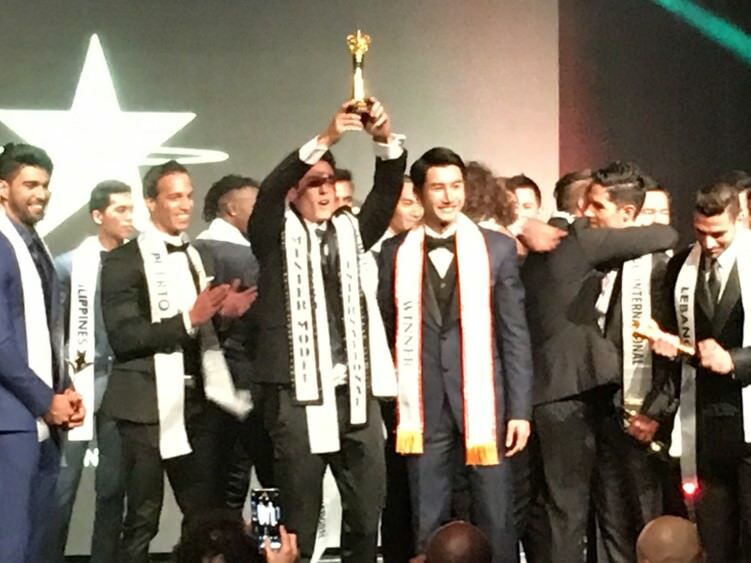 While Costa Rica was presented with the trophy, Luis said no, this is our “Steve Harvey” moment and that the actual winner is Fernando de Noronha. 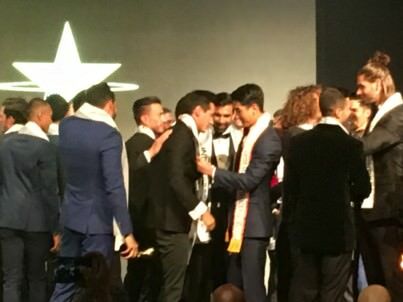 Costa Rica looked confused (I don’t think he spoke English so he didn’t understand what was being said) but presented the fitness trophy to Fernando de Noronha with a smile. I missed if something was said to him in Spanish so he’d know what was happening. The rest of the awards were then announced. 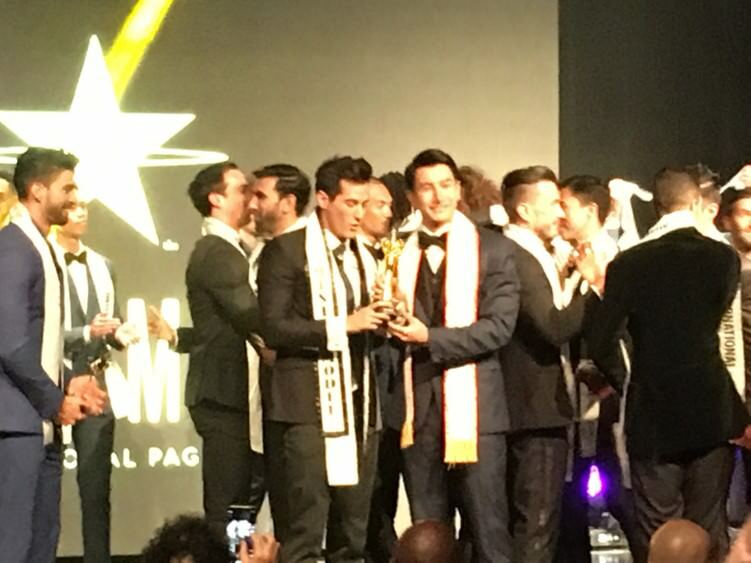 National Director of the Year – Luis said most of the national directors were not present at the event. The top five were the national directors of Chile, El Salvador, Puerto Rico, Mexico and Brazil/Fernando de Noronha. The winner was then announced as El Salvador, Carlos Jimenez (I think is his name). He was present and came up on stage to collect his award. Luis mentioned that El Salvador had also won this award a few years ago. A short video was shown of the contestants in their national costumes. The top five national costume finalists, as released on Instagram, were not announced. 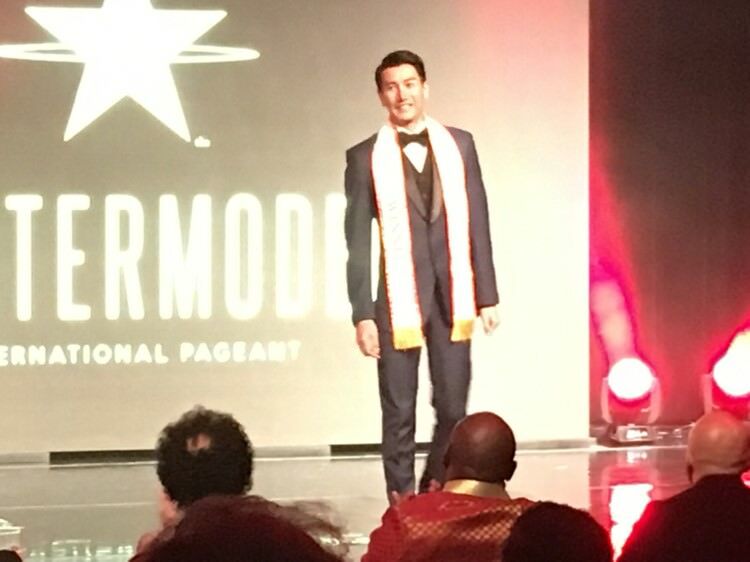 Indonesia was announced as the winner and he came from backstage in his national costume (which is why he was first in parade of nations). He explained that the costume was a mixture of three of the many cultures of Indonesia, Chinese, Balinese and Javanese. Last, they announced the student designer award. One of the judges, from Miami International University, came on stage and explained how the contestants had modeled student designs the past two days during Men’s Fashion Week. 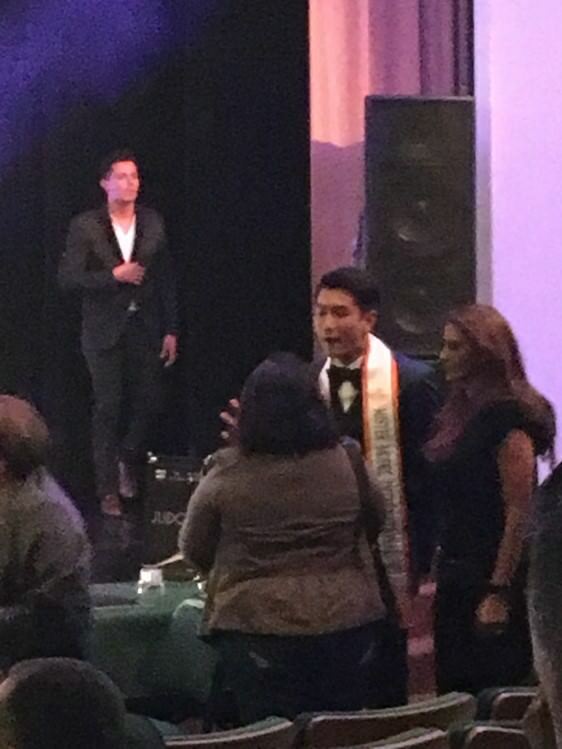 She then tried to leave the stage until Luis reminded her that she needed to announce the student designer award. Mr. Dominican Republic came from backstage wearing the winning design and a young woman in the row ahead of me gasped. She (a student designer from Vietnam) was announced as the winner and went up on stage and accepted her award. She was very surprised and happy. Last edited by Danieruw on Sun Apr 15, 2018 4:59 am, edited 1 time in total. All the award winners returned to their spots and now it was time to announce the 16 semi-finalists. Luis said this group of contestants is the best group ever! He then talked about how personality is more important than face and body due to what the winner will be expected to do during his reign (he did not say what those duties are). He commented how important the interview is in determining the semi-finalists. Several contestants did extremely well in the interview, he said, and some only did well, which I interpreted to mean that some tanked the interview and that’s why some favorites did not make the top 16. 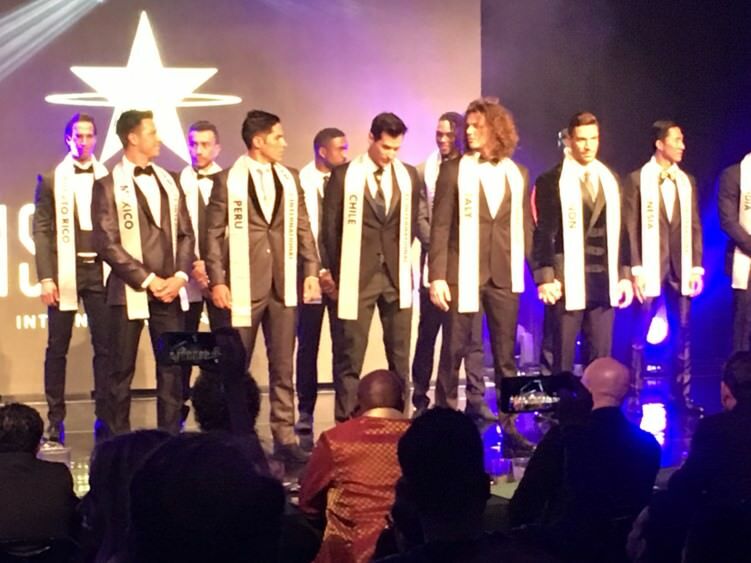 The 12 who were not semi-finalists left the stage. I was surprised by the exclusion of Venezuela, USA and Cuba, all three of whom could claim to be the host contestant (very large Cuban and Venezuelan communities in the Miami area) and were highly applauded by the audience. But what Luis said about the importance of the interview means that surprises are expected. The contestants left the stage to get ready for the swimsuit competition. Singer Vanessa Wong came on stage and sang a forgettable song. Luis said she’d performed at last year’s pageant or some event he organized and he knew he wanted her to perform here. She had a voice that would be perfect for the freestyle music that was popular in the late 80’s and early 90’s, nasally and brassy (this isn’t a criticism – I love late 80’s freestyle and singers with that kind of voice). But her style of dance-pop has fallen out of style (at least here in the US) since last year as hip-hop has enjoyed a resurgence and EDM has displaced more melodic pop music. Many audience members took this opportunity to go to the “lobby” and get drinks or (if you are a student designer) to leave. Probably 1/4th of the audience left before the swimsuit competition. Fools!!!! 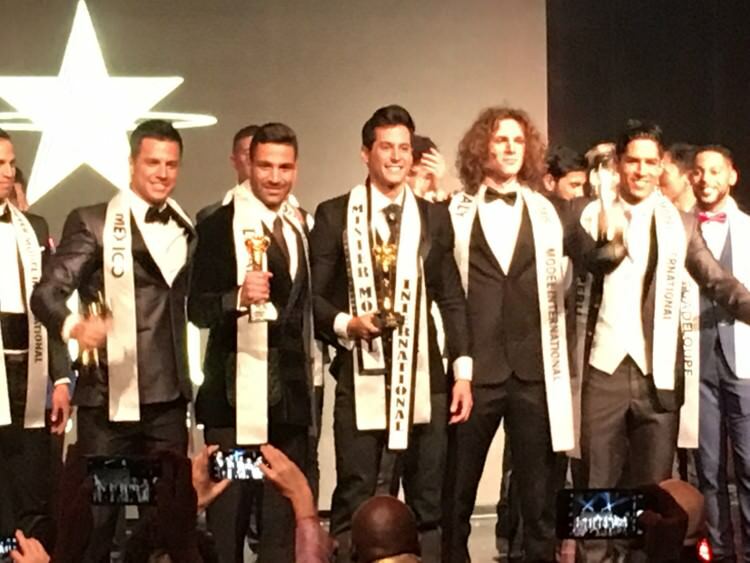 Luis introduced the 10 judges (1 for every 2.8 contestants), 9 men and 1 woman. The judges table was set up in front of the first row of seats so they had the best view (though the venue was so small there were no bad seats). The woman was the director of the fashion school at the Miami International University of Art and Design who had presented the student designer award earlier. She was joined by a fashion designer who presented during Men’s Fashion Week; the publisher of Mr Black Magazine (sponsor); owner of a talent and model agency (and maybe something to do with wigs – it wasn’t clear – very convoluted - but he was also a sponsor); a Dominican fashion designer; an American fashion designer; a Panamanian fashion designer (Panamanian-American Chamber of Commerce was a sponsor); an official make-up artist for Miss Universe who also does something else; Narapat Sakunsong, the reigning Mister Model International from Thailand; and Paul Iskandar, the reigning Mister International from Lebanon. 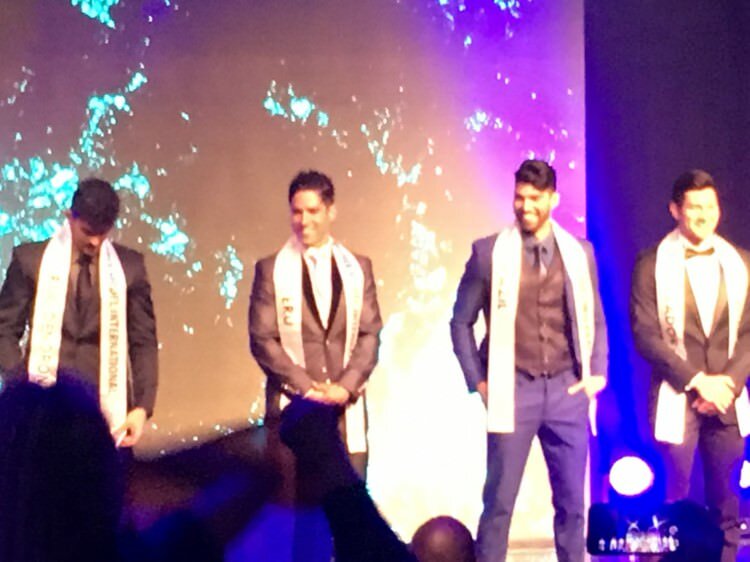 So yes, I was in same room for a few hours with a Mister World, the hottest Mister International ever, and two Mister Model Internationals (current and to be crowned) at the same time! It’s alright to be envious. Last edited by Danieruw on Sun Apr 15, 2018 5:01 am, edited 1 time in total. The 12 make a round across the stage and leave while the first semi-finalist stands in front of the beach scene with his back to us, wearing a long flowing gauzy sleeveless “robe” with a hood. Each contestant takes off the robe at some point, at the very beginning at the back of the stage, at the mark at the left side of the stage, or at the center of the stage for the final pose. Most do one of the first two. 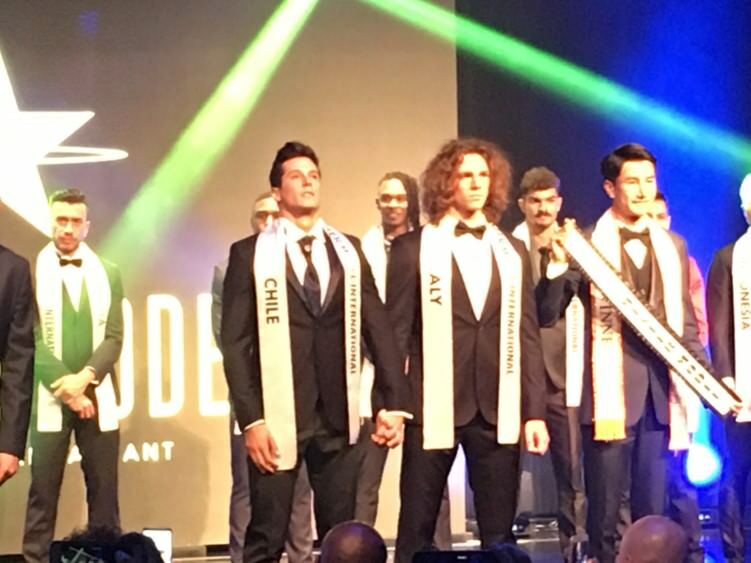 They are also not wearing their sashes since those would cover certain important body parts necessary to demonstrate each contestant’s fitness, ie muscular chests! India begins and he has a great body! I feel like he’s always been underrated in this competition versus the Latin Americans. He doesn’t have the best face, but he should definitely move on due to his body. And wearing a yellow suit is smart as it helps him stand out. Next is Brazil, one of the favorites, though I think he is weaker than previous Brazilian contestants. He does just as well as India, though he is not as built, and I think black is a safe choice for his suit. Brazilian contestants tend to smile a lot and have fun with the process, and he is no exception. Third is Puerto Rico. I haven’t been a fan of his. I find him too lanky and angular. But, let me tell you, swimsuit is his competition! He’s wearing a teal suit, which is very smart as it accentuates his already considerable package. He would easily win the “ms_melanie” bulge award for most hung! I wish I’d gotten a picture of him as he walked across the stage since that’s when his “gift” was most obvious. But I don’t know if it’s enough to move him to the top ten. Next is Mexico, winner of the Best Body award, and I can see why. He is hot! He wears black as well, but with contrasting waist and leg bands. He is always smiling, and when he gets to the front center of the stage for his final stop, he makes the “Wakanda Forever” gesture from “Black Panther”, which he does several times during the pageant. He is followed by Fernando de Noronha, who is not someone I really noticed until tonight. He’s much better in person than photos. He’s wearing a pink/lavender/lilac suit and he is working the stage and his body. He dances a little while he walks, and when he gets to the front center of the stage, emphasizes his pose with a few small pelvic thrusts. If Puerto Rico had done that, there’d be multiple faintings in the audience. Great job for Fernando de Noronha. Next is Lebanon. He wears a dark navy blue suit that is bit smaller in cut than most of the other suits. He has a great body and a lot of charisma. He’s definitely one of my favorites in this round. Very handsome, he has some vocal fans in audience. Next comes Chile wearing a solid white suit, which is a good contrast from most of the darker suits that have preceded him. White swimsuits can look like underwear, which it does here, but that’s not an issue. He is incredibly handsome and has a great, but not over-built, body. It’s obvious why he was the top choice of so many in the PG. His smile comes across as a little shy, which I find endearing. Like Lebanon, he is very charismatic. I’m on the fence about the next contestant, Italy. I don’t like long hair on men so I automatically downgrade him just for that. He wears a solid black suit in the same smaller style as Lebanon, but he appears skinnier and lankier than the other contestants, another feature I don’t favor. But he has a really cute face, and I wonder how much more I’d like him if he cut his hair. I’ve placed him last in this category. Next is Curacao. He’s wearing a brown suit (really?) with contrasting bands. He’s not as built as the other contestants, though he is as tall. He has a beautiful smile and displays it throughout the competition. He doesn’t remove his robe until the very end so I think we miss some of the performance other semi-finalists provided. I’m not sure his performance is enough to move to the top ten. 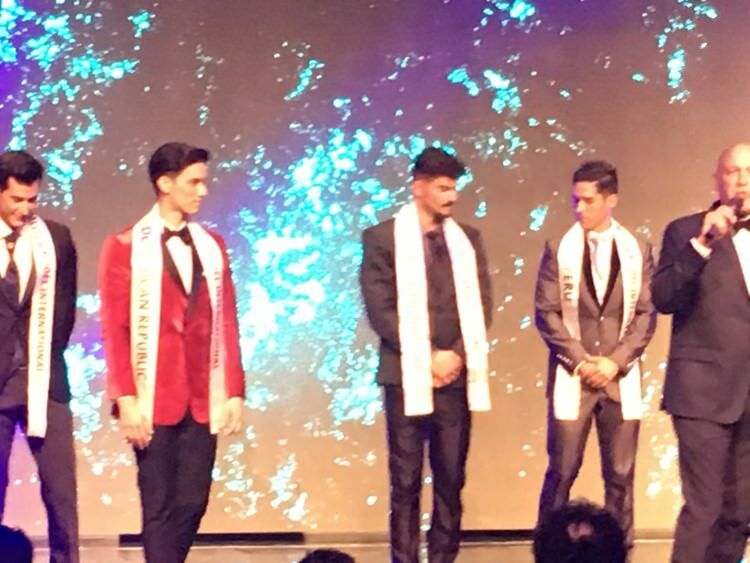 Peru is next and appears to be smaller since he is between two taller contestants. Peru reminds me very much of Mexico, but with a slighter build and less symmetric face. He’s wearing red, which is very smart since no one else has worn that attention-getting color yet. It’s clear he works out but doesn’t have the bigger build of some contestants. But I like him and think he should move on to the top ten. The tallest of the top 16 is next, Ethiopia. He’s wearing a red, white and black banded stripe suit. He doesn’t appear to have the runway experience of the other contestants, but he’s good looking and I’m glad he made the top 16. He’s skinnier than most of the contestants, which I think will prevent him from moving on. Now it’s time for the Dominican Republic, another contestant who appears small next to Ethiopia. His suit is also a banded stripe suit, but in this case is red, blue and white. He’s very cute, but his body seems oddly proportioned. His pectorals seem too large in contrast to the rest of his torso. He works the stage in a similar way to Fernando de Noronha, but I don’t feel like it works for him. He seemed uncomfortable doing it and should’ve just walked like most of the semi-finalists. Next is Indonesia. He’s wearing a black and white suit that resembles a 2Wink style. He looks like he is the oldest of the semi-finalists. He has a good body but doesn’t have the stage presence of the other contestants. He looks better in photos. Now we have Paraguay, who definitely looks better in person than in pictures. His pictures make him look like a hungry vampire, but in person he looks warm and jovial. He’s got a great smile. He’s wearing a solid white suit in a trunk style that contrasts with the skimpier white suit worn by Chile. Paraguay is the most visibly out of shape, though this is relative to the other contestants, not the general public since he still has visible abs. I actually really like him (in spite of his big ugly dumb tattoos) but I’m sure he won’t move on to the top ten. Speaking of big ugly dumb tattoos, next is the Philippine Community in Europe. He’s wearing a yellow suit with a black mesh band, the most risqué suit of the semi-finals, and it looks great. He’s probably the skinniest of the semi-finalists and it makes him look bony. He’s got a great face, but I think he would be more attractive if he grew his hair out. But, of course, he knows how to walk. I think he should’ve applied some body glitter to the large black tattoo covering his shoulder to disco it up. And finally, we have El Salvador, who is freaking adorable in person! He’s wearing a dark blue suit with a white band, again like a 2Wink style, but with an exposed cord. Stunning, one of my favorites, I can hardly take my eyes off him. There’s no question in my mind that he is moving on to the top ten. If I was the judge, I would move on Mexico, Lebanon, Chile, El Salvador, India, Brazil, Peru, Fernando de Noronha, Puerto Rico and Curacao. Last edited by Danieruw on Sun Apr 15, 2018 5:02 am, edited 1 time in total. 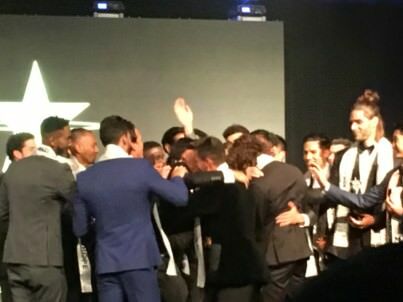 The 16 semi-finalists congregate at the front of the stage for the final look. Because Mexico won the Best Body award, the female cohost comes out and starts to talk to him, presumably about how he keeps in shape. It’s all in Spanish with no translation, but clearly it has something to do with his workout routine as she is practically feeling him up right there on stage. She finishes and leaves. And the top 16 stand at the front of the stage. And stand there. And continue standing there. And time continues to pass. And they still stand there. I’m not complaining since I get to continue looking at them in their tight swimwear for many minutes. They’re supposed to be announcing the top ten, but for some reason it is taking a while to tally the votes (no computer, just paper). Finally, Luis the host comes out and says there’s a delay and to fill the time he’s going to have the top 16 tell us something about themselves. He announces that one of the contestants is a police officer back home, and Brazil comes forward. They converse briefly in Portuguese, but there’s no translation so I don’t know what was said. Then he goes back to the first semi-finalist, India. India is from Bangalore in southern India. Brazil has already spoken and so is skipped over. Puerto Rico speaks in Spanish with no translation. Mexico is also skipped over as he already spoke earlier. Fernando de Noronha speaks in Portuguese with no translation. Lebanon is a horseback riding instructor and trainer with over 20 horses. Chile speaks in Spanish with no translation. Italy is from Verona and has been a swimmer for many years (he has a swimmer’s build). He’s also a student of communication science. Curacao is the youngest contestant in competition. He is only 16 years old! He’s a high school student and wants to study photography. He says that the other contestants have treated him like family. Peru spoke in Spanish with no translation. I missed what Ethiopia said. Dominican Republic spoke in Spanish with no translation. Indonesia gave a greeting in Spanish (which got a huge reaction from the audience). He’s a property consultant and model. Paraguay spoke in Spanish with no translation but the host mentioned that he is or was a student of psychology. Philippine Community of Europe is from Italy and is a bar manager. He says that he is representing not just the Filipinos in Europe, but those all over the world (especially since the Philippines did not make the semi-finals). El Salvador speaks in English, which I don’t expect but am very happy about. 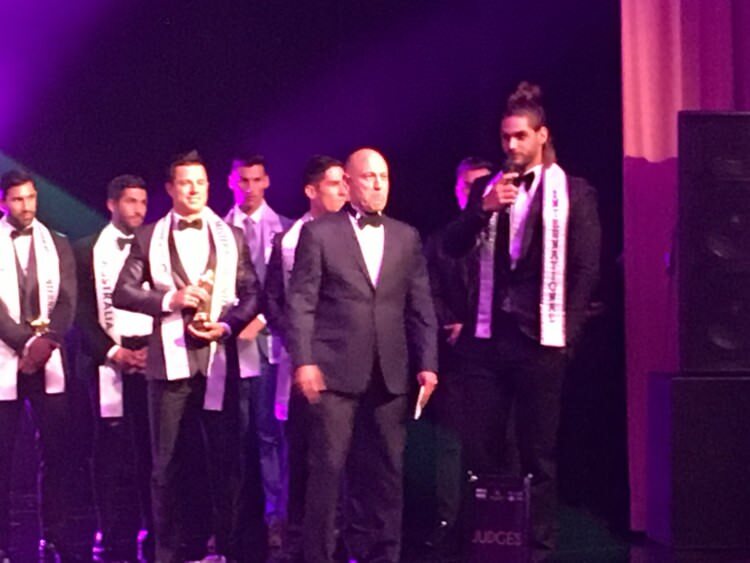 He says that this competition (Mister Model International) is the most competitive one he’s ever taken part in. 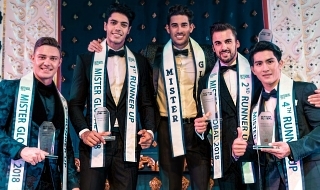 Which I find odd since he competed in Mister World 2016 and made the top 10 as one of the five choices by the judges (the other five were winners of the fast track events). Finally, they announce the top ten. We take a break for about ten or fifteen minutes while the contestants go back stage to change for the evening wear competition. People go to the lobby to get drinks, while some people get pictures with Paul Iskandar, Francisco Escobar and Narapat Sakunsong. Last edited by Danieruw on Sun Apr 15, 2018 5:04 am, edited 1 time in total. Now it’s time for the evening wear competition. The contestants who are not in the top ten come out and make a circuit of the stage, led by Bolivia. Again, the contestants start at the back center of stage and do a circuit to the front center of the stage. 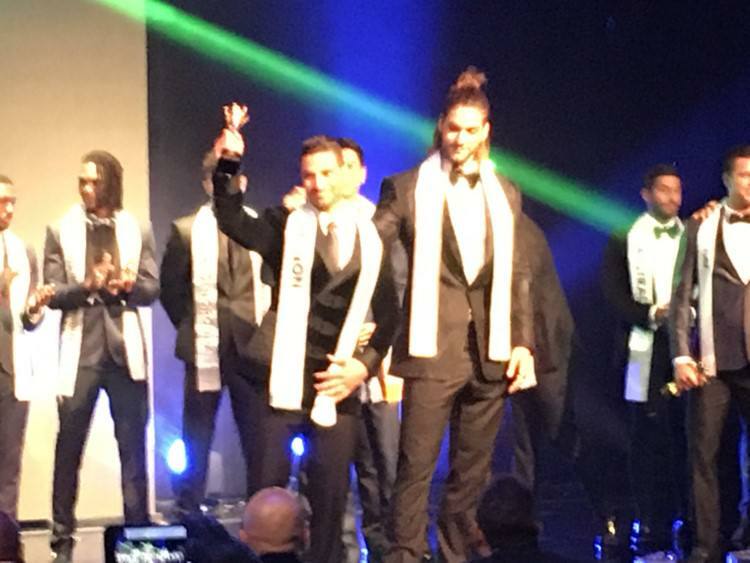 They are wearing their sashes this time. First up is Lebanon who looks great in a velveteen jacket with contrasting lapels and cuffs and a solid necktie. Next is Italy in a standard tuxedo without a cummerbund, which I think (as a tuxedo wearer) always looks odd. I think he could’ve done more to stand out, or at least not look like he did the bare minimum. Chile is next and I was expecting more from him. But he’s wearing a nice tie with an unusual knot and a jewel. I’m not sure it will be good enough to move on, though he is extremely handsome. Fernando de Noronha walks a little too fast, which causes one half of his sash to keep flying over his shoulder, threatening to fly off completely. This happens about three times until he finally just takes it off and carries it. Fernando de Noronha also made the unfortunate choice to wear a cocoa brown satin-esque shirt and dark brown tie with his black suit. Unfortunately, I don’t think they make a good combination. Despite having a lot of personality, I don’t think he will move on. Dominican Republic is next and is the only contestant to wear a non-neutral color for part of his suit. His jacket is bright red, which makes him stand out, but it is too large for his frame. I think if it had been cut to conform to his shape that he could’ve gone further. Peru follows and is also unremarkable. He wears a slate gray suit and white shirt with a white tie. Next is Brazil, wearing a slightly brighter than navy blue suit. He’s the only contestant wearing a vest (contrasting black) and is wearing a shirt and tie in shades of slate gray that complement the blue and black of the suit and vest. He looks stunning. 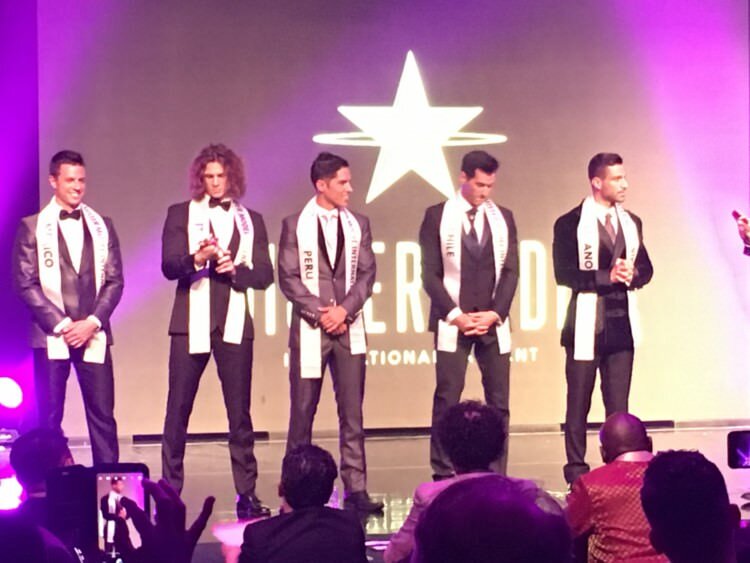 Like Fernando de Noronha, he walks too fast and completely loses his sash immediately, leaving it crumpled on the floor at the back of the stage. 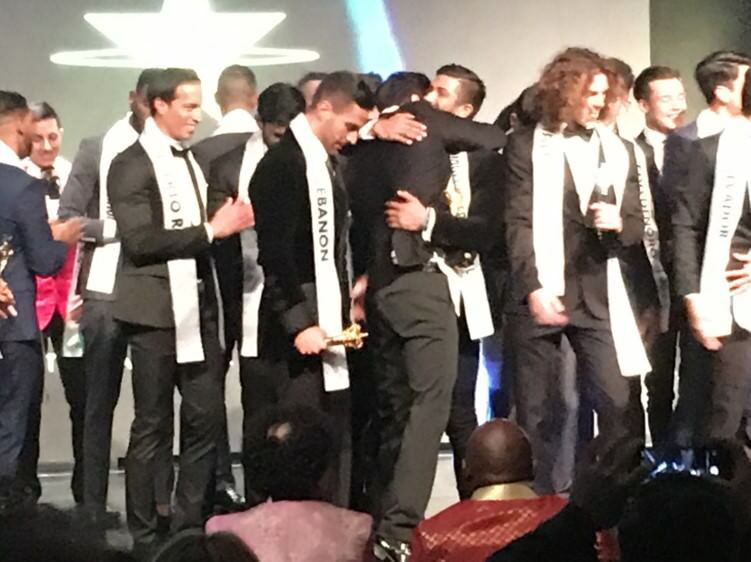 El Salvador comes out and picks up Brazil’s sash, carrying it with him during his evening wear presentation. He wears a standard tuxedo, which looks fine. And he has a great smile, which makes him stand out. So cute! Mexico is next and he wears a suit/tuxedo that appears to be sharkskin, the shiny suit material associated with gangsters. It’s a little understated for him, I think. I was expecting more from someone who is clearly very confident. He looks like he is enjoying himself. 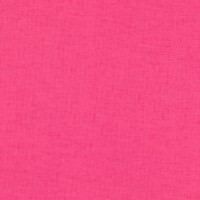 And finally we have Curacao. He’s very popular with the (remaining) audience and is wearing a standard tuxedo which appears to be slightly too big for him. And his bow tie is odd. It looks flat and gold, almost as if it is made of metal. 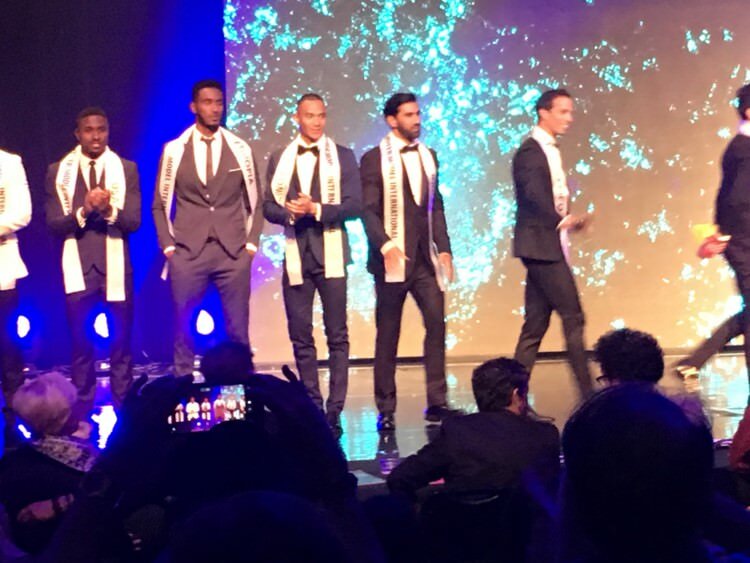 Based on the evening wear competition, the five I think should move on to the finals are Brazil, Lebanon, El Salvador, Chile and Mexico. While the scores are being tallied, they show a blooper reel of contestants messing up their lines when filming on the street, messing up their choreography during rehearsals and generally acting silly. The top ten remain on stage and watch with us. Last edited by Danieruw on Sun Apr 15, 2018 5:05 am, edited 1 time in total. Before they announce the top 5, they announce the continental winners. Africa – Ethiopia – Luis, the host talks for a long time about this, but basically says that he gets it because he is the only contestant from Africa. According to the initial contestant list, there were supposed to be three African contestants, but Algeria and Nigeria didn’t compete. This is an issue across most pageants, the underrepresentation of African contestants, particularly in male pageants. Miss World 2017 had 25 contestants from Africa while Miss Universe 2017 had only 10. 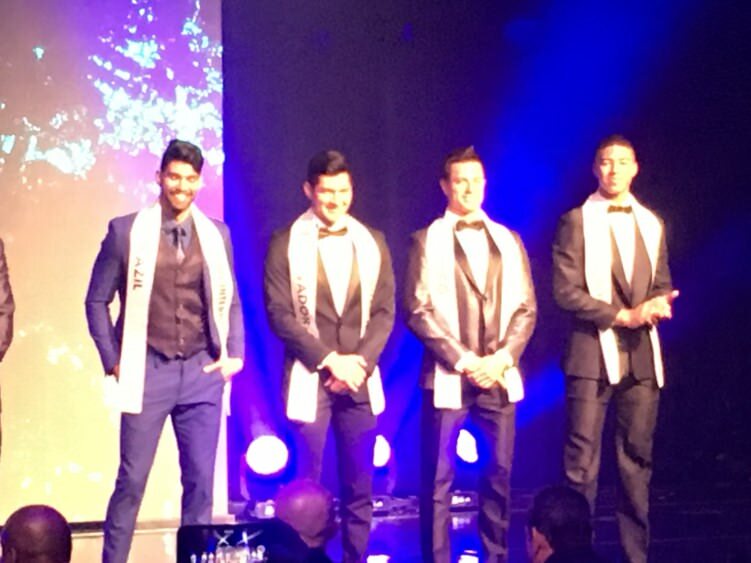 On the male side, the most recent edition of Mister World had 4 contestants from Africa while the most recent edition of Mister International had 0. 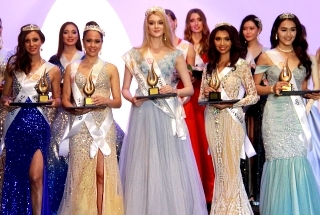 I don’t know what the answer is, but whatever the impediments are, be they financial, political, cultural, etc., the international pageants need to figure out how to make it easier for African countries to compete. Each receives a trophy. Those that are not part of the top ten (Ethiopia and India) go back off stage and the top five are announced. Those that didn’t make the top 5 leave the stage and it’s time for the final questions. 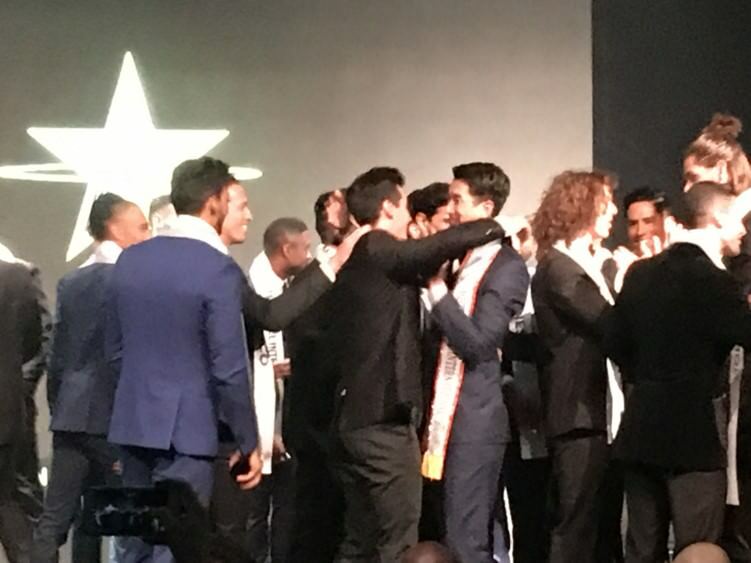 Someone involved with Mister Model International is obviously a huge fan of Miss Universe (who isn’t?) since I know I’ve heard versions of these questions before. There is an interpreter for the Spanish-speaking contestants. 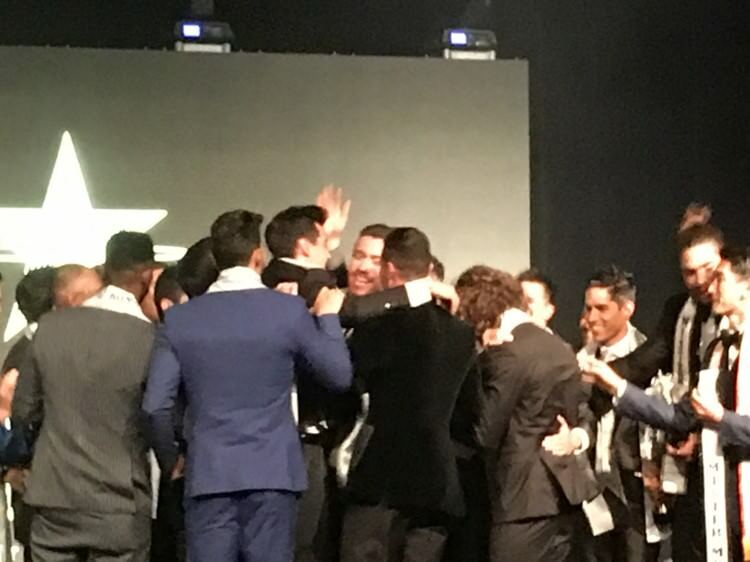 While the top five were hugging and celebrating, they got out of order, which means Lebanon goes first. Luis mentions that in rehearsals Lebanon never wanted to go first and yet he must here. Lebanon apologizes for being a little hoarse. He’s gotten sick from all the air conditioning used in Miami, he says. It's true, we do over-air condition buildings here in south Florida. Answer (Paraphrase) – It’s not about physique or physical strength. It’s what is inside, in the heart. It’s how you treat other people and are honest with other people. And also, how you treat animals. Great answer in my opinion. He’s not the most handsome of the final five but he’s my favorite of the final five. Answer (Paraphrase of translation) – Can learn sensitivity and learn to say yes and no. Chile answers in Spanish and the interpreter translates. The answer sounds like the question is flipped, i.e. “what can a man learn from a woman?”. There’s a great reaction from the audience to his answer in Spanish so I don’t know what happened. But suddenly I’m worried that I’ve blown my PG by predicting his victory. Answer – Peru gives a very long answer in Spanish and there is no translation, though the interpreter is on stage and translated the question for him. The audience goes wild for his answer, but without translation, I have no idea what he said. It should be noted that not all the judges (such as Paul Iskandar and Narapat Sakunsong) speak Spanish and I don’t know if anyone told them what he said. But that is a disadvantage for Peru. Answer (Paraphrase) - Years ago, he began to model, but his father was against it because he thought modeling was only for girls. But when Italy came in last in a modeling contest or pageant, his father was in attendance and told him that he’d never seen him so happy. Excellent answer and the audience loves it. I think he’s a big threat to take the crown. Italy is offered an interpreter, but refuses. I don’t think they actually have an Italian interpreter since the host said it in an almost joking manner. 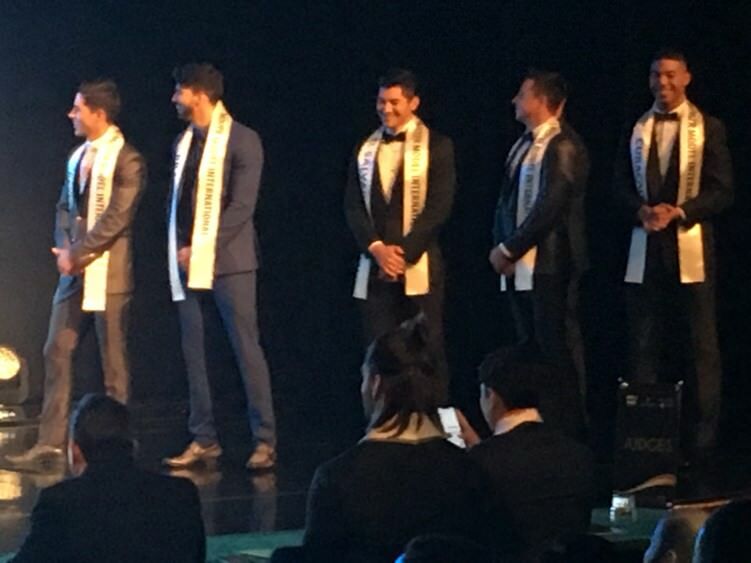 This is a recurring issue for male pageants, where the only interpreters usually available are for Spanish speakers. And we’ve seen this hurt contestants who don’t speak English or Spanish, especially contestants from Central Europe and Asia. 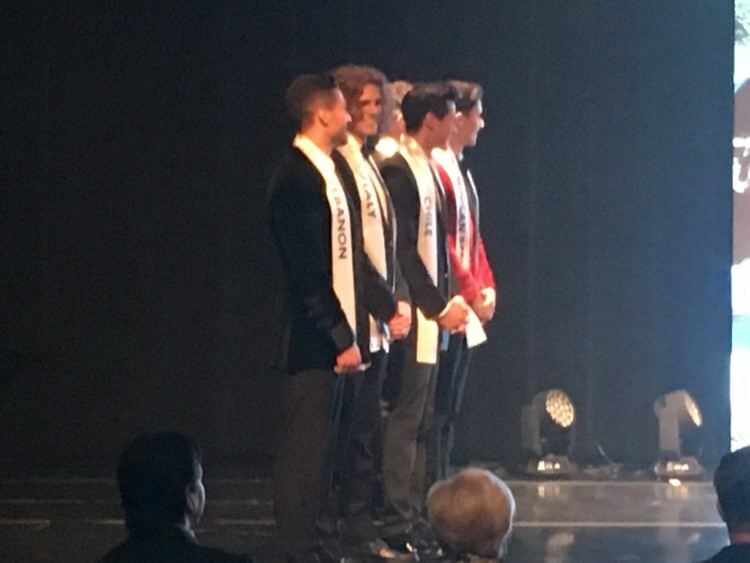 Think Czech Republic at the 2013 Mister International Pageant, who was the big favorite to win but ended up as 5th runner-up because of the lack of interpreters who spoke his language. Answer (Paraphrase of translation) – Today (the pageant) is the best moment so far. Don’t live in the past or the future. Just enjoy the present. Not a great answer but the audience likes it. He’s so hot! Last edited by Danieruw on Sun Apr 15, 2018 5:06 am, edited 1 time in total. While the final results are being tabulated, the rest of the contestants return to the stage. For some reason, El Salvador comes back on stage several minutes after the other contestants. Netherlands is missing his sash. Cuba, standing next him, asks about it, in case he doesn’t realize it is missing. Netherlands shrugs and glances in the stage wings, but indicates it is too late to get it. They announce the results of the silent auctions in the lobby. Only a few are announced, including Australia, so it seems like most of the items didn’t receive any bids. A video is shown about last year’s winner, Narapat Sakunsong from Thailand, showing his victory and some of the things he’s done during the year. He takes his final walk and speaks (in very halting English) about how this contest and title have allowed him to support his family. And how all the guys competing are also like his family and are in his heart. It’s actually incredibly sweet. It’s time to announce the final results. Each finalist is presented with a trophy. 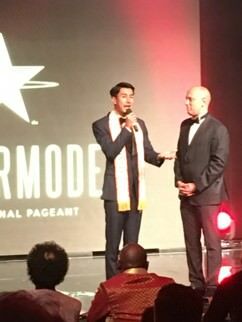 At this point the host invites Paul Iskandar, Mister International 2016/17 and one of the judges on stage and asks him to speak. Paul is a giant! He’s a full head taller than everyone else on stage. Paul thanks everyone and says that he’s planning to move to Miami. Paul will be two hours from me! Hey Paul, when the terrible traffic in Miami drives you crazy (and it will), you are welcome to come to my place on the west coast. No clothes necessary! 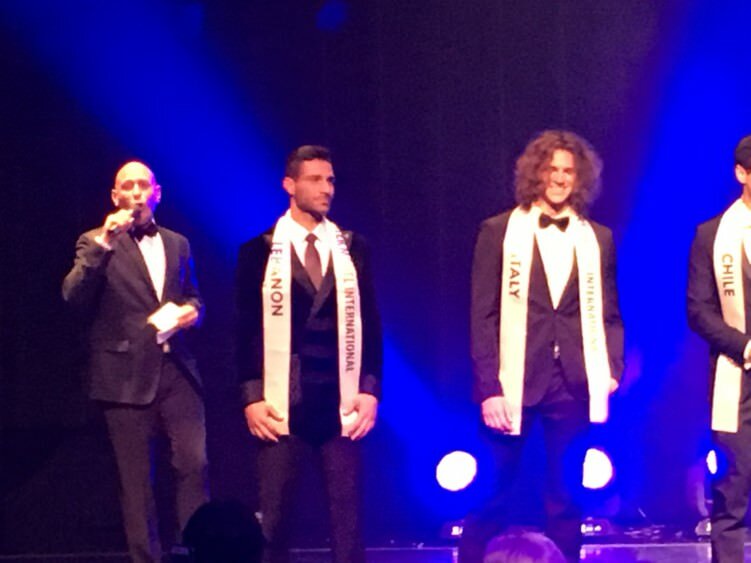 Of course, since Paul was brought to the stage, I know this means Lebanon is 2nd runner-up. 2nd Runner-up is Lebanon. Paul presents him with his trophy. We’re down to Italy and Chile. Both would be great winners. 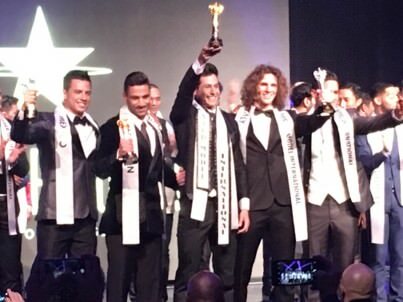 Chile is Mister Model International 2018! 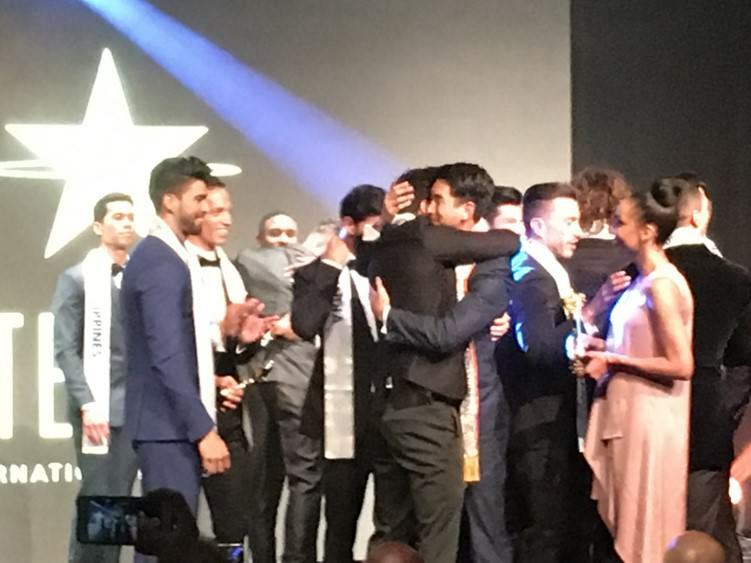 He seems to be a popular choice with the other contestants, who circle him to congratulate him. 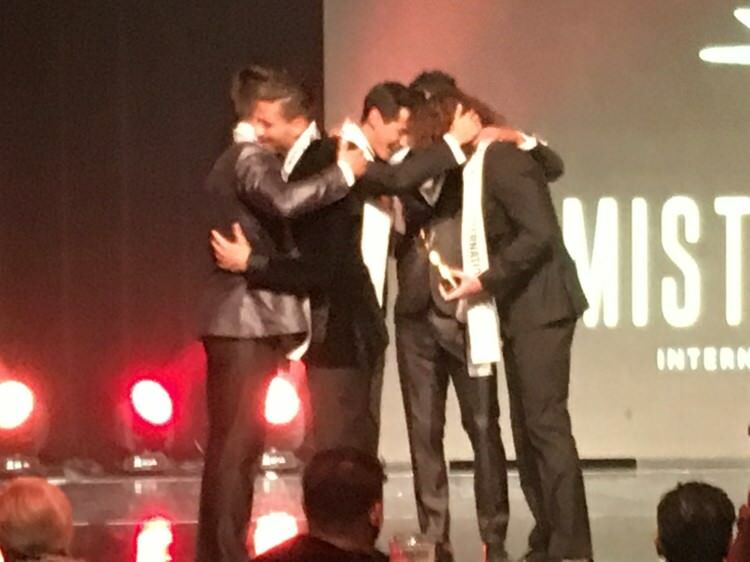 Luis announces that Mister Model International will be held next year in Miami again. I hope they can do more with the show, do some better marketing (maybe some target marketing to the large Latin American and gay populations in Miami), get more contestants (especially from Africa and Europe), and hold it in a better venue. 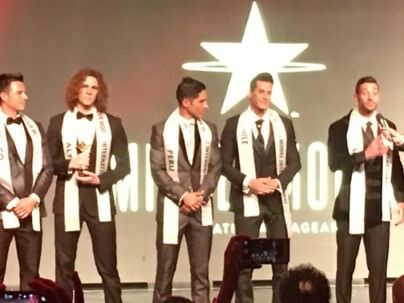 It won’t be Miss Universe, but it can grow to rival something like Mister Global. Luis seems enthusiastic and to know what he’s doing. Chile’s a great winner so I’ll be interested to see what he does over the next year. I don’t know if I’ll attend next year if it is indeed in Miami. I enjoyed the show, but the traffic in Miami is too much. Plus, I was too shy to approach Paul or any of the contestants (especially El Salvador, Brazil and Lebanon). to ask for pictures with them. If Paul does move to Miami, maybe I’ll get the chance later and will be brave enough to do so. [size=150]It’s alright to be envious. Well... I AM VERY ENVIOUS. You're with Francisco and Paul, who wouldn't be envious. Thanks for this report. Felt like I was there watching it as well!